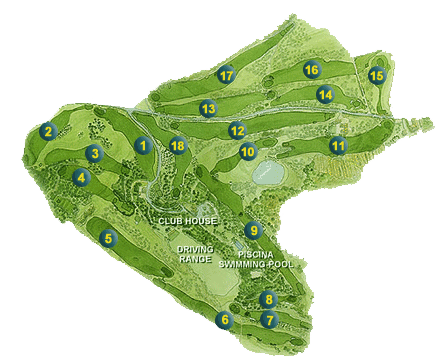 The new course was designed by an englishman and an irishman, Cecil Blandford and Peter Gannon. They used the natural contours of the Chianti slopes to produce an outstanding course, threaded through the indigenous vines, olive trees, maritime pines and broom. The course is not long, but demands a high degree of skill. The greens are small and well defended by bunkers. The sloping fairways also present a great challenge. To play Ugolino is not just to indulge in a game of golf, it is to wander through a landscape of great natural beauty, surrounded by olive and other fruit trees. It is an unforgettable and uplifting experience. In his book “fifty places to play golf before you die”, the writer Chris Santella includes Ugolino as one of the fifty. Opening hole with a slight dog-leg to the left. The main hazard is a group of trees on the left. Green is defended by 3 bunkers. Fairway slopes steeply to the left and there is out of bounds all along the right side. Main problem is making the green with the right club. Best to drive to the left of the trees but not too far, or the large pine on the left of the green will present problems. Long tricky par 3 with trees on the left and a raised green that presents a putting challenge. Very long with green out of sight and with a fairway which carries the ball to the right towards the out of bounds for the drive and towards the bunker for the second shot. Demanding drive with out of bounds on the right. A second which calls for precision and loft to clear the trees on the left, green has a considerable slope. Sloping fairway with pines to the right and cipresses to the left. The second shot has to navigate an oak tree in the middle of the fairway and the bunker on the right. A classic par 3 needing concentration, accuracy and good club selection. The narrow fairway demands courage and determination. The second shot must take into account the slope to the right, while the third requires great accuracy to avoid greenside bunkers. Long and tricky par 3 with several bunkers and a right sloping fairway. An uphill drive with out of bounds on the left. Second shot can be blind and needs care. Green defended by several bunkers and sloping considerably from back to front. Out of bounds on the right and a fairway sloping to the left. Second shot is the most demanding in order to set up the correct line for the shot to the green. Drive has to be straight without fear of out of bounds on the right and the olive trees on the left. Dog-leg to the right needing accurate second. Green is very small. Clever par 3 with well defended green made very difficult by a pronounced slope to the right. Bunker on the right at driving distance and small well defended green. Drive should be kept to the left. Out of bounds all along the right side. Green has 4 bunkers and slopes from the back. Dog-leg to the right requiring absolute precision for both drive and second shot.